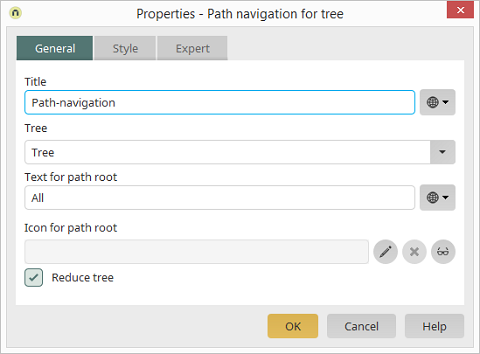 It's possible to set up a path navigation for the tree for both edit and view elements. In this way, you can navigate through its structure using either the tree control or by entering the path. Provide the path navigation with a title. Click here for more information about defining titles. 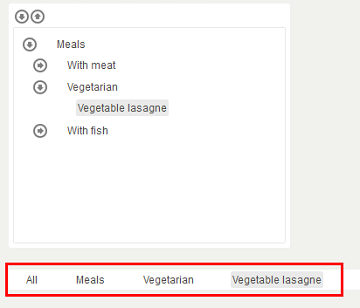 In this drop-down list list, the tree control can be selected, for which the path navigation is to be set up. Here, the text will be defined that is to be shown at the start of the path. An icon for the path start can be selected here. Deletes the image meaning it will no longer be shown. Opens a dialog where the text for end devices, which cannot display images, can be defined. If this option is activated only the sub-elements of the selected node will be visible. The parent nodes can be reached via the path navigation. Without this setting all nodes will be always visible in the tree. The path navigation only serves as orientation guide then.